Following an impressive run on the West End, which finished in February 2017, just shy of it's 2 year anniversary, the Broadway smash hit jukebox musical Beautiful: The Carole King Musical is now touring the UK. With actress Bronté Barbé taking on the mantle of the eponymous Brooklyn born singer-songwriter, the touring production is as fresh and energetic as ever. With more than a couple of embellishments here and there, Beautiful: The Carole King Musical tells the story of Carole King's life and career, from her early days writing music with classmate and childhood sweetheart Gerry Goffin to her first ever concert at Carnegie Hall in 1971. There's love, friendship and heartbreak, and of course, plenty of brilliant music to tie everything together. Admittedly, the plot is not the most exciting or groundbreaking one, but King's impressive back catalogue provides more than enough enjoyment to fill a couple of hours. It's impossible to resist the bouncy melodies of It Might As Well Rain Until September and Take Good Care Of My Baby. The end of act 1 also packs a punch, with King unveiling some dramatic news about her relationship with the conflicted Gerry Goffin, and joining in with fictional girl group modeled on The Shirelles, as they sing One Fine Day, voice cracking as she reels from the news. King's discomfort with her surroundings is signified through her slightly frumpy clothing, which contrasts the sleek and glamorous 1960s chic which dominates Derek McLane's set design and Alejo Vietti's costumes. Bronté Barbé does a fantastic job of portraying King, sounding and acting with inflections which mirror King's own, but never impersonating her. The musical's B plot follows King and Goffin's friends, the songwriting duo Barry Mann and Cynthia Weil, played by Matthew Gonsalves and Amy Ellen Richardson. Not only do the duo provide ample comedy relief, their presence also allows for a couple of additional toe tapping tunes to be included in the show, such as He's Sure The Boy I love, and You've Lost That Lovin' Feeling, the latter famously being the most played song on American Radio and TV in the 20th century! 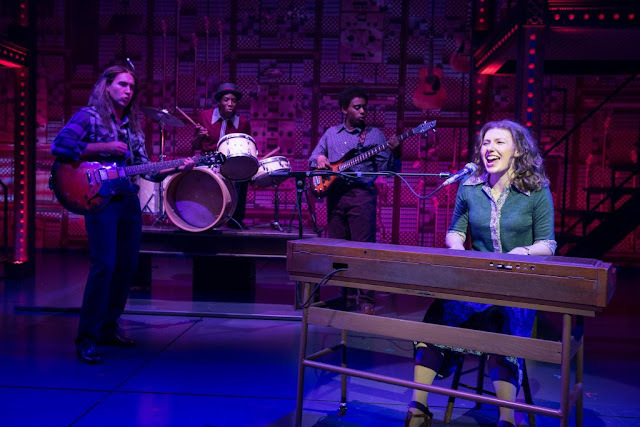 It may not be the most historically accurate biography, but with one toe tapping tune after another, Beautiful: The Carole King Musical provides pure and simple escapism, and does justice to one of the greatest singer-songwriters of all time.